Chris Stapleton’s highly anticipated new album, From A Room: Volume 1, will be released May 5 on Mercury Records Nashville and is now available for pre-order digitally and with physical bundles. The highly anticipated full-length record is the first new music from Stapleton since 2015’s breakthrough double Platinum solo debut Traveller and will be followed by From A Room: Volume 2—coming later this year. Coming off a sold-out Canadian tour last month, Stapleton is currently in the midst of an extensive U.S. tour. 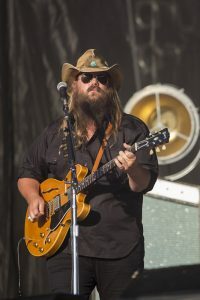 “Chris Stapleton’s All-American Road Show” will span throughout 2017 and includes stops at L.A.’s The Forum, Denver’s Red Rocks Amphitheatre and New York’s Northwell Health at Jones Beach Theater and will feature Brothers Osborne, Lucie Silvas, Anderson East, Brent Cobb, Margo Price and Marty Stuart as special guests. Of a recent performance, the Seattle Times declares, “…Stapleton dazzled the sold-out crowd with a barrage of songs that defy easy categorization while receiving the kind of deafening cheers reserved for superstars.” Seven new dates were recently added to the tour itinerary, which go on-sale at LiveNation.com this Friday, April 7 at 10:00am local time. See below for complete tour details.